Before we dig into the full preview of Anvil’s Legacy (the next free Halo 5 release coming on September 8, alongside Halo 5: Forge for Windows 10), let’s first talk about Halo 5’s newest playlist, Action Sack. In last week’s blog, we promised we’d have an ETA for Action Sack, and I am happy to relay that the playlist is now available. It features a mix of community-created modes, and for the first time in Halo history, offers 4v4, FFA, and Infection modes – all in one playlist. To get a breakdown of the playlist and each mode contained within the launch lineup, head here. "And the circle is complete. 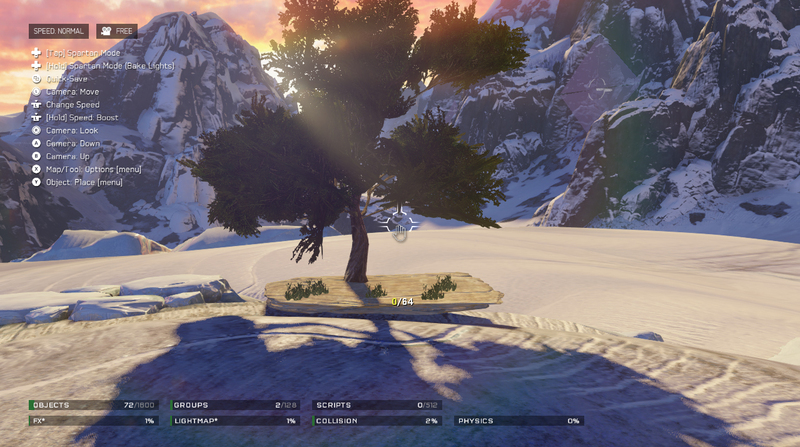 The idea of allowing the users to create Prefab groups, share them with each other, and stamp them in other maps is one of the biggest concepts we set out to accomplish in H5 Forge. It took a lot of heroes to pull this idea off; most of which are outside the core Forge team. I cannot thank them enough for all of their work and dedication to making the game changing idea of Prefabs a real thing. Excited they’re about to finally land in the hands of the community so we can see the creative things they do with this new tool! 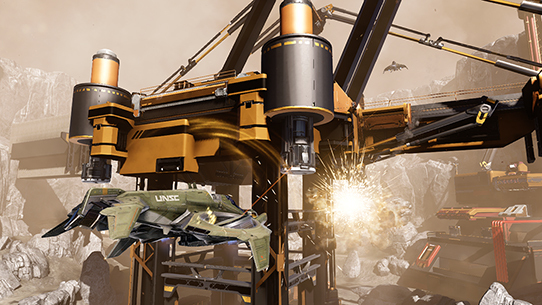 September… 8th… almost… here…"
Earlier this week, we announced the name and September 8 release date of the next Halo 5 content release – Anvil’s Legacy. We also showed you a sneak peek of a few things that were inside, including new weapons, new skins, an unnamed Magnum, looks at new maps, and more. Today, we’ll take a look at all of the content inside. Let’s start with Mercy. As showcased on Wednesday, Mercy is a reimagining of Halo 4’s Haven. To get the details on how the updated Sangheili art style came to be, I caught up with artist Ryan Peterson. "Being only one game removed, we wanted the remake of Haven to have a main visual landmark reminiscent of Forerunner themes from the original map and maintain the otherworldliness, yet take the general aesthetic as far away from the previous version as possible. To do this, we switched the palette from futuristic Forerunner to ancient Sangheili. The Skybox Team also had the brilliant idea to relocate the map from the clouds to below ground within a monumental cavern, allowing for a major change in lighting. The main visual pitch of the map was expressed as “Ancient Sangheili Water Temple”, a nod to a classic game location trope. The idea of water channels replacing the long hallway floor panels from Haven couldn’t be passed up. And the recessed fire chambers providing light to the outer halls made a great counterpart to the water theme. 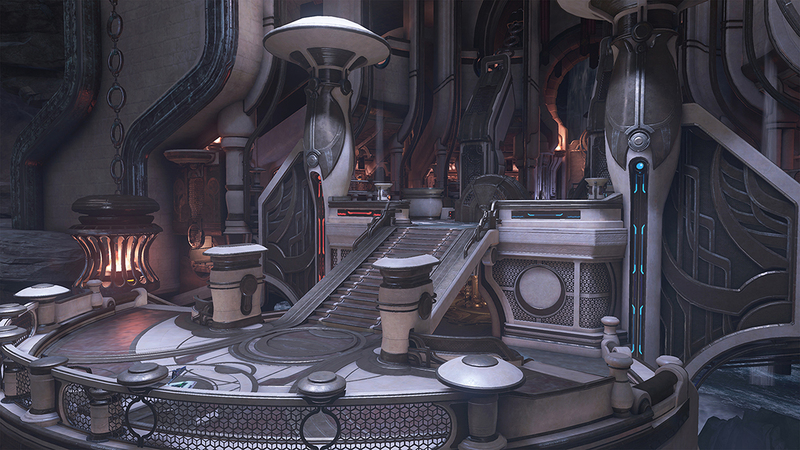 The main goal for the feel of the level was for a “living” temple - still used by the Sangheili in modern times, reminiscent of real world locations like the Notre Dame Cathedral. This aspect allowed us to bring a lot of movement to the map – running water, roaring fires, flickering shadows, dancing caustics, moving chains, and counter-weight machinery. It also allowed us to find a unique mid-point between the two periods of Sangheili architecture from the Campaign. An ancient temple, still maintained and in use, offered us the chance to create a version of the ruins from Campaign that would have previously existed, before time took its toll on an abandoned place, and much of the valuable metals and stones were stripped from the structure. 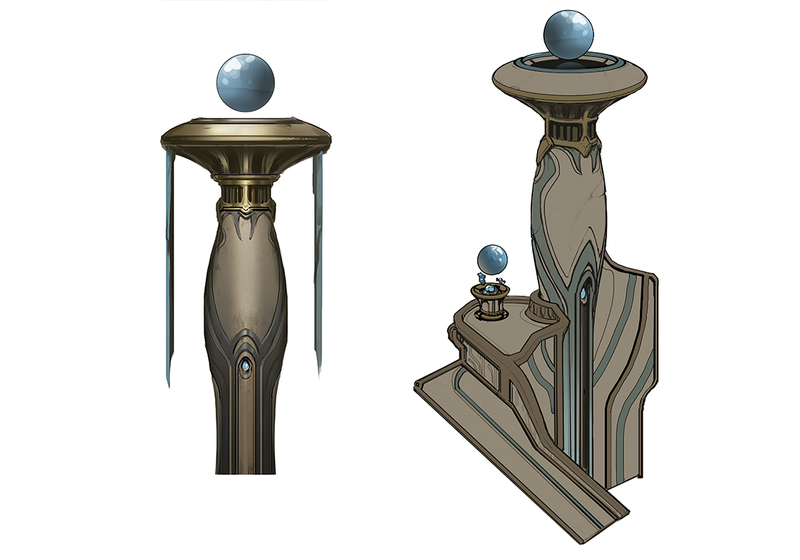 Additionally, we could “retrofit” the nooks and crannies of the temple with more modern Sangheili technology." Grim has more details on Mercy (as well as Temple, the new Warzone Assault map) in this week’s issue of Canon Fodder - simply keep reading to run into it. You can also catch a look at Mercy during the Anvil’s Legacy live stream, which will take place on Tuesday, 9/6. Next up, I think it is only appropriate that we get into the full reveal. You ready? We’re diving straight in. There’s a lot to take in here. Brand new Assault Cannons, some new Magnums, new paint jobs for a few armors you might like, new attachments, new skins, and more. Let’s give a few specific items some well-deserved attention. 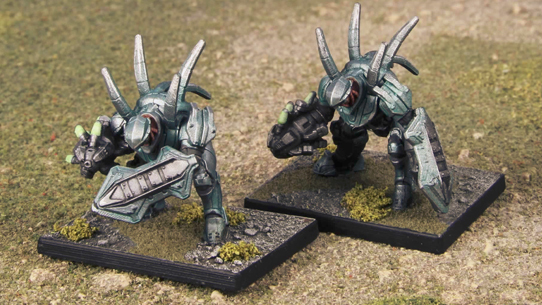 To get more details on the new Assault Cannons, I grabbed some time with Dan Wiksten of Sandbox Team fame. "Need to protect a base against infantry? The Wicked Grasp should make it easy to hold on and defend. It fires a burst of homing plasma shots that will drop a Spartan really quick. 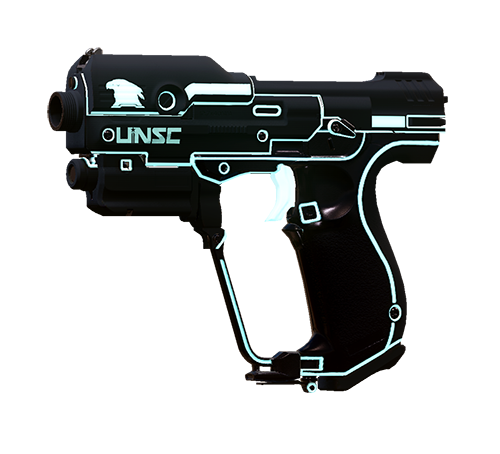 The projectiles have a slower velocity than most UNSC weapons, so effective range is diminished and the weapon is best used at short to mid-range." "Equally effective against infantry as well as medium vehicles, the Berserker’s Claw requires a short charge up before it can be fired, but does fire projectiles that will explode on impact and possibly take out a cluster of targets with one shot. The projectiles also track flying vehicles, and are a great counter to early vehicle play." "Want to have your cake and eat it too? 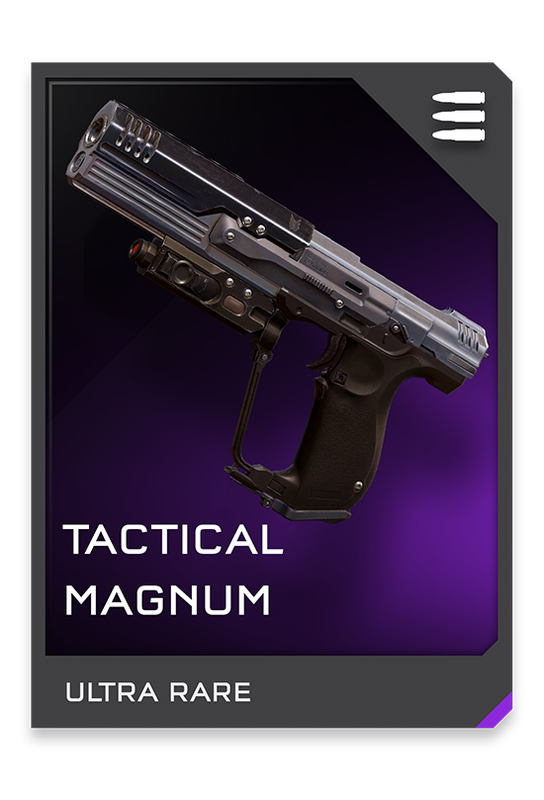 The Tactical Magnum allows you to both be effective at distance as well as sneaky up close. Equipped with a silencer as well as a 2x mid-range Smart-Link for maximum flexibility." Increases effective range and reduces firing signature. Security configuration issued to ONI’s armed-response teams. 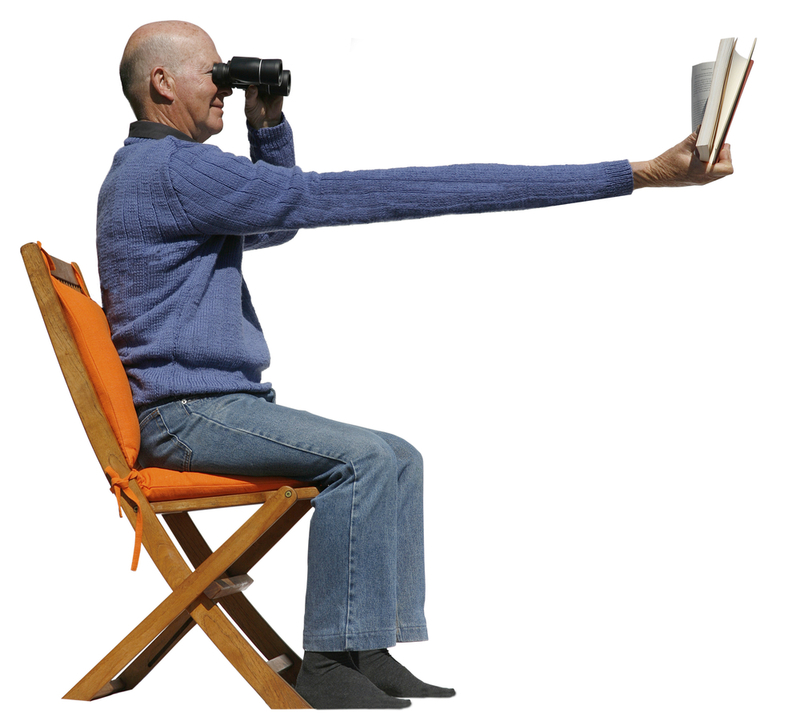 Army SPECWARCOM configuration currently undergoing final evaluation. Increasingly popular configuration offered for sale in civilian markets on the frontier. Interdiction configuration used by Marine and Spartan boarding parties. Many moons ago, we spotted a post from Vetoed about neon weapon skin concepts, and this Twitter exchange followed. 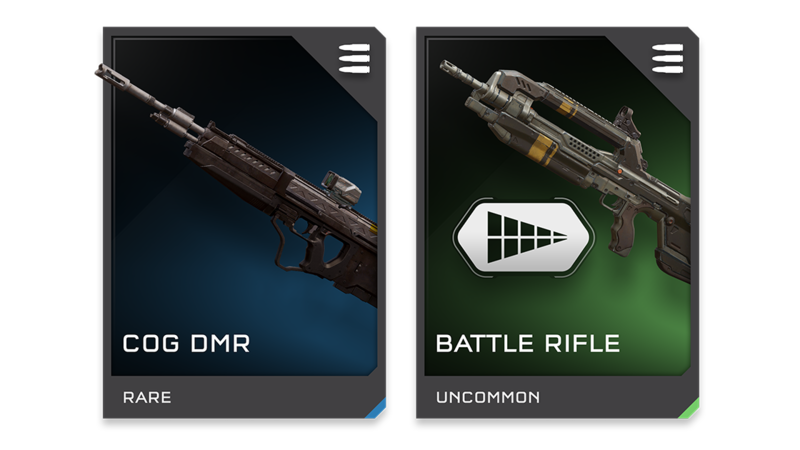 We sent the idea over to the REQ and progression teams, who went to work on planning the skins for a future update. That update, my dear friends, is nearly here. Vetoed has pledged to never change his weapon skins once he’s unlocked them, and we’re happy to say that we’ll of course be unlocking all of these for you, Vetoed, as soon as the update releases. 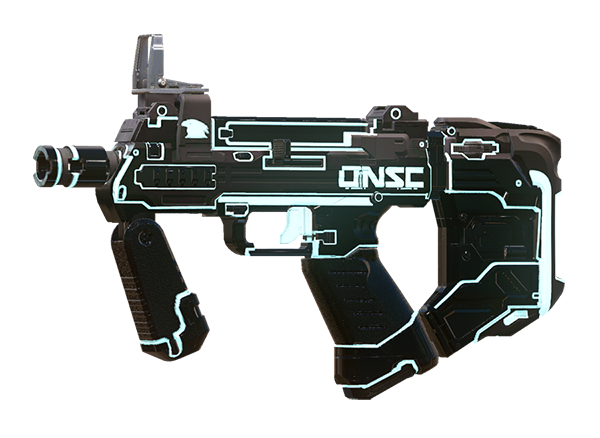 Normally, we show off just a few of the weapon skin samples in the Community Update, but would anyone mind if we showcased all of the Master Control skins this week? Anyone? Okay, we’re doing it. And now, I hand things over to Grim, who’s got the latest on a variety of different Halo-themed fronts. Take it away, good friend. It would be my extreme pleasure to do so! This past week has seen some pretty awesome action for Halo fans – from a Halo 5 rebirth of Halo 4’s safest Haven and the impending release of Halo 5: Forge, to a brand new Windows 10 Halo app and the triumphant return of Action Sack in Halo 5: Guardians. In case you’ve missed much of this news throughout the week, let’s make sure every Spartan reading this is nice and caught up. Earlier in the week, we announced the Sept 8 release date for Halo 5: Forge alongside Halo 5’s latest free content salvo with Anvil’s Legacy. 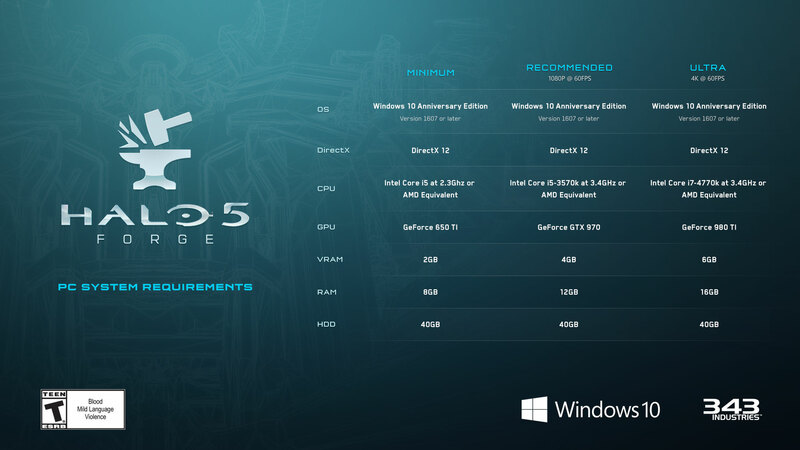 Just today, we pulled the curtain back on the System Requirements that Windows 10 PC players will be shooting for when they boot up Halo 5: Forge. We also have been keeping a close eye on community questions regarding the upcoming title, and wanted to elucidate on a few of the most prevalent ones. Q: How do I publish maps from PC to Xbox One? How do I import maps from Xbox One to PC? A: Creators can simply save their map to Xbox Live, which makes it available for download or editing on Windows 10 PCs using Halo 5: Forge or Xbox One using Halo 5: Guardians. Q: How do I play against other people in Halo 5: Forge? A: This works very similarly to the Custom Games multiplayer experience in Halo 5: Guardians. Using Xbox Live on Windows 10 PCs, players can create an Xbox Live party and then invite that party to a Fireteam in Halo 5: Forge. These players can then choose teams, the leader can load a selected map and mode, and they can begin to play together. 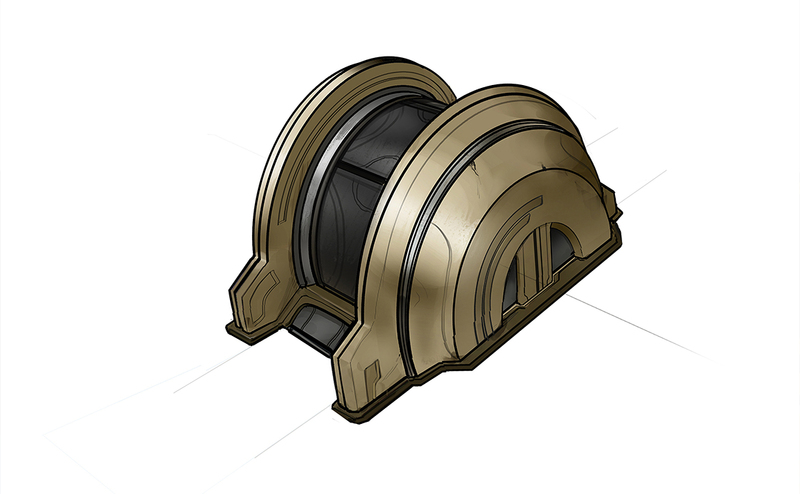 Q: How will Spartan Customization Work in Halo 5: Forge? A: All Spartan customization is handled in Halo 5: Guardians and on HaloWaypoint.com. 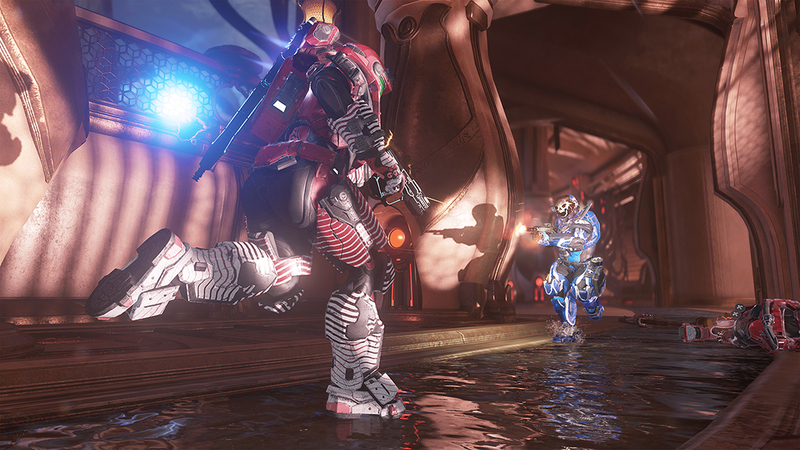 Halo 5: Forge will reflect any changes made on those platforms. Q: Will Custom Games in Halo 5: Forge support Xbox Live features like Achievements and Gamerscore? A: Yes, Halo 5: Forge will have Achievements with Gamerscore! Stay tuned for more info as we get closer to launch. Among the eclectic menagerie of bits and bobs we’ve detailed this week was the announcement of a new official Halo app coming to Windows 10 PC, also on September 8. 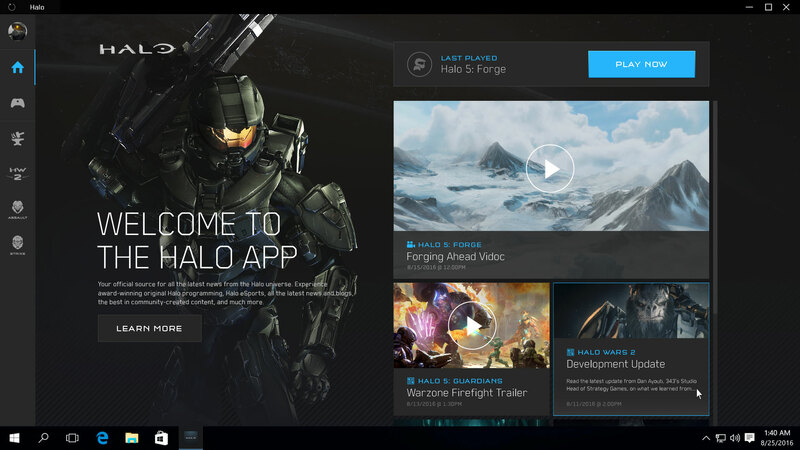 Providing the latest news, videos, tutorials, featured community content, update notes, and more from across the entire Halo universe, the Halo app will let players quickly and easily find, download, and launch Windows PC Halo games from 343 Industries. If you’re interested in learning more, check out some finely-crafted words by one of 343’s Executive Producers, Brian Albrecht. Of course, what would new Halo content be without a new Halo Livestream to showcase it in? If watching 343'ers wax ridiculous about all things Halo tickles your fan fancy, then mark your calendars for Sept 6, 2 p.m. PT and join us on Twitch.tv/Halo, YouTube, Facebook, and Beam. If that isn’t enough viewing options for you, we’re also trying to arrange for Unyshek to record an interpretive dance version of the Livestream for us to GIF for all eternity. We'll be celebrating our PAX West survival with a smorgasbord of Anvil's Legacy goodness, community content, and overall merriment, and we'd love nothing more than for you to join us. Quite literally, stay tuned. This edition of every Halo fan’s favorite fiction feature showcases some of the deep-lore deliciousness arriving with the Anvil’s Legacy content release. From two new maps set on the surface of Sanghelios, to some exciting new armaments to add to your Spartan's arsenal – let's check out the lore we've got in store! As we've mentioned previously, both Mercy and Temple are set on the Elite homeworld of Sanghelios. Despite their general shared location, each map showcases a beautiful and distinct flavor of the overall Sangheili aesthetic – from Mercy's gorgeous alien architecture set beneath a blanket of stormy skies, to a once-forgotten warrior temple defiantly standing against the passage of time and the light of three suns. The architects of this haven wrought miracles of stone and metal to house vesper bells, hushed scriptoriums, and oracular pools. The healing waters spun its heartspring are a boon beyond measure, enriched with nootropic compounds and microscopic sprites that cool tempestuous souls and mend even the most grievous wounds. Sealed away by the Prophets for two millennia, the temple halls once again ring with songs of victory while Kaidons clad in traditional finery drink herb-laced droughts and consult the records archives before planning their next campaign, as they did in days long before the Covenant. Sangheili kaidons and Arbiters once made pilgrimages to this temple to sit in meditation and reflect on duty and the momentous actions they were about to undertake. But that was when the temple was whole, a living tabernacle dedicated to spirits of war and hearthfire. Now it is a silent mausoleum, abandoned during the Sangheili's service to the San'Shyuum. Warriors have returned to the temple, but only echoes of wisdom are to be found here now. For years, Halo fans have fantasized of turning the powerful assault cannon of a downed Mgalekgolo into their own personal tool of destruction. Now for the first time, thanks to Anvil’s Legacy, they can finally do just that in a true-blue official capacity. Spartans are well-versed at sourcing weapons from the remains of their enemies. The Berserker's Claw fires a devastating fuel rod shot after a short charging cycle. This fuel rod will track aerial targets. The Lekgolo that remain in this stolen limb retain a feral vestige of their once-expansive composite mind. The Wicked Grasp fires bursts of tracking plasma shots. Fans looking for a few more pistol options to add to their favorite loadout will no doubt be stoked to wrap their Mjolnir-clad fingers around these serious new sidearms. Whisper-quiet tactical pistol loaded with armor-piercing rounds, tailored for Spartan force reconnaissance missions. Match grade Magnum with integral baffle-free suppressor and 2x full-VISR Smart-Link. That will do it for yours truly this week. Really looking forward to seeing many of you out at PAX West, where we’ll have Halo Wars 2 playable on the show floor. Hope to see you there! Until next time… Live well, play Halo, and don’t forget to get back in the Sack. Thanks Grim. As small, violent children, Unyshek and I used to play hours of cops and robbers in the backyard. Now, our childhood memories of breaking and entering have been brought to life in Halo 5. When watching the below Forge Showcase by Forge Labs, we were simply blown away by the attention to detail and complexity of the scripting required to make this minigame work the way it does. Get your friends together and pull off the greatest heist in Halo history! Download the map here, mode here, and check out more below. The Halo Music Video Hell series is one of the most highly regarded machinima series in the Halo community. ImSuck has been making these videos since 2005 (over 10 years!) beginning with Halo 2, and they’ve only gotten better and better since. His creative use of Forge has allowed him to create entirely new scenarios that would’ve otherwise been impossible. He (and we) would like to give you a fair warning that some of the music, language and themes inside of these videos are intended for mature audiences. Check out the vimeo here. Im Ze Bubble really doesn’t like insects, especially Wasps. Watch this clip to see why we want him at our next 343 picnic. Watch here. And that will do for this week. There’s a lot of cool stuff on the way, and we can’t wait to jump in with you. The Community Update will break next week for PAX West festivities, so the next time we’ll be talking in an official capacity will be the 9/6 livestream, and the Community Update will return on 9/16. To those of you traveling to PAX, we wish you a safe journey, and we’re looking forward to seeing you soon. All others, we’ll see you on September 6 for a livestream preview of everything you see here and more. Welcome back to this week’s edition of the Halo Community Update. It is quite a busy time within the (still-new-feeling) studio walls, and very much a calm before the upcoming storm of events and releases. 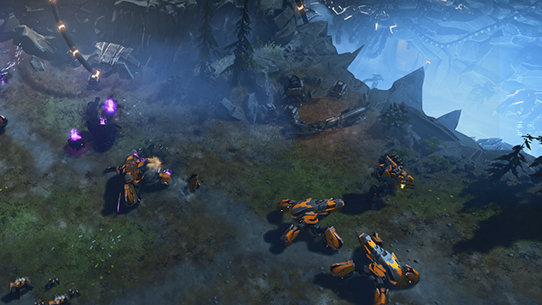 The Halo Wars 2 team ships off to Germany for gamescom tomorrow, and they bring with them new Halo Wars 2 content to show off.